Home / sports / Fifa President Infantino To Visit Nigeria On Sunday, 24th July 2016. 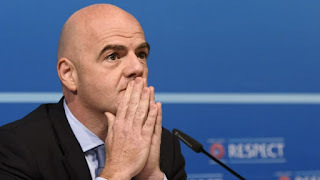 Fifa President Infantino To Visit Nigeria On Sunday, 24th July 2016. Fifa president Gianni Infantino and the secretary general Fatma Samoura will be in Nigeria on July 24, 2016, the Nigeria Football Federation has announced. The football administrator who was elected Fifa president in February chttps://www.blogger.com/blogger.g?blogID=7404615949779320552#editor/target=post;postID=7727147065199431803onfirmed the visit following a meeting with NFF President Amaju Pinnick in Paris on Sunday. 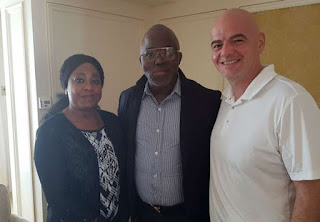 “The FIFA President and Secretary General will arrive in the Federal Capital Territory, Abuja on Sunday, 24th July on a two-day working visit to Nigeria,” Pinnick told thenff.com. The visit is an endorsement of Pinnick's NFF-led administration as against Chris Giwa's that is embroiled in a dispute over the running of Nigeria's football governing body. During the visit, Infantino and Samoura will pay a courtesy call on President Muhammadu Buhari in Abuja, hold meeting with a host of African FA presidents who are expected in Nigeria to join the NFF to receive the Fifa topshots and attend an evening session with corporate Nigeria in Lagos. The duo will also meet with Governor Akinwunmi Ambode of Lagos State before watching the finals of the NFF/ZENITH Bank Future Eagles Championship.